Heat rhubarb and sugar to boiling in 3-quart saucepan over medium heat, stirring occasionally. Cook 8 to 10 minutes, stirring occasionally, until rhubarb is very tender. 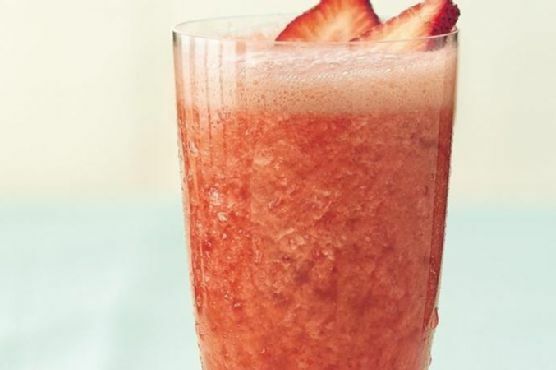 Stir in strawberries. Spoon half of the strawberry mixture into blender. Cover and blend on high speed until smooth. Pour into large nonmetal container. Cover and blend remaining strawberry mixture; add to container. Stir in vodka and 12-ounce can of carbonated beverage. Freeze at least 8 hours until frozen and slushy. For each serving, stir together 1/2 cup frozen mixture and 1/2 cup chilled carbonated beverage in tall glass until slushy. Slush on the menu? Try pairing with Cream Sherry, Moscato d'Asti, and Port. A common wine pairing rule is to make sure your wine is sweeter than your food. Delicate desserts go well with Moscato d'Asti, nutty desserts with cream sherry, and caramel or chocolate desserts pair well with port.